"Time for the quarter mile distance was 6.05 seconds or 148.76 mph. There's your new Champion!" 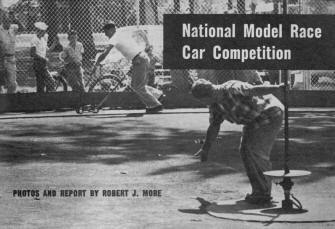 That was the judge's announcement at the conclusion of the 1954 National Model Car Competition. The cars ran in a 70-foot diameter circle on a tether, screaming away with their 0.0601 in3 displacement engines turning 22,000 rpm! Six laps at that diameter equals 1/4 of a mile - the distance over which the cars are timed. It must have been quite a sight and sound as those model cars tore around the track! Anderson, Indiana, hosted the event. 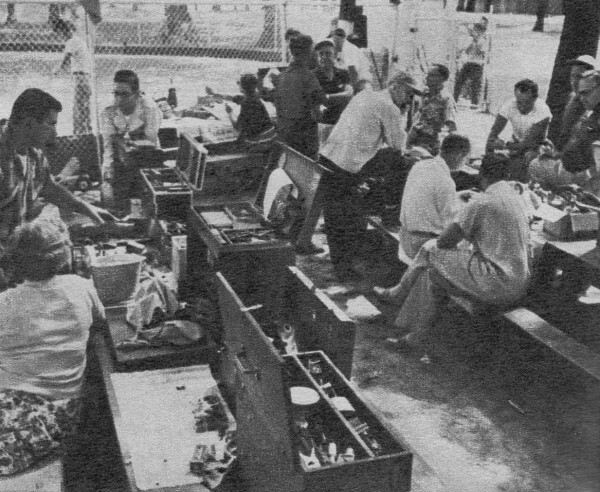 The American Miniature Racing Car Association (AMRCA), which officiated at the event, is still in existence today and still runs races in the same manner. Top speeds of over 200 mph have been recorded. 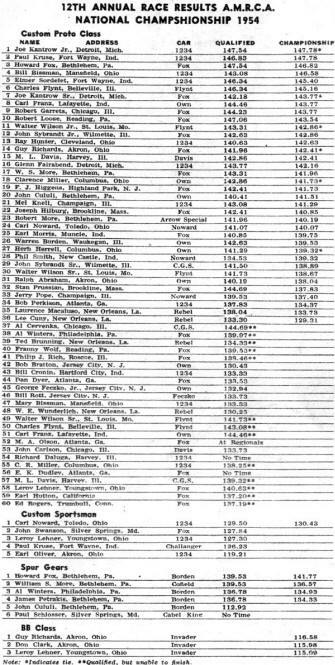 They have on their website a complete list of all nationals results since 1940 - including this one from 1954! It is interesting that in more than 50 years the record speed has only increased by 40%. 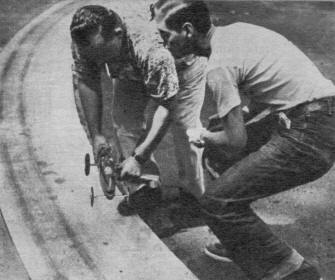 Getting his car underway with starting push-stick, Cleveland's Ray Hunter ended in 13th place; George Feczko starts whipping. All of Anderson, Indiana, turns out - including Hiz Honor the Mayor - when the model race gang hit town for annual classic. The old favorites plugged along turning one good, fast run after the other. It looked as though things were running according to pattern. Kruse, Fox, Loose and many of the other "hot shots" were up there and it looked like it was just a matter of which one got the best track and weather ... he'd be the winner. But someone sure forgot to tell this to a fifteen-year-old by the name of Joe Kantrow, Jr. He had qualified high - in fact tied for first - but no one noticed that too much. Thoughts on race day were on which one of the "names" would win. Would it be Bissman, Franz, Prussian or someone else? Kantrow tied at 147.78 mph. So it remained till the end of the day and then it had to be run off. Tension fell on the pit area. Just minutes earlier Doc Morris' car had crashed as the cable parted to add even more pressure. Happy pair: Walter Wilson, 22 (left), holder of Custom class world's record with phenomenal 151.75 mph; John Syrbrandt, 16. Kruse was first to run and it was a good one - 146. Now it was up to the Motor City lad. All other speeds he had turned before meant nothing now. He shoved her off, the engine coughed, and she was under way. The car built up speed rapidly for almost a mile. All eyes were on young Joe hoping he wouldn't wait too long. 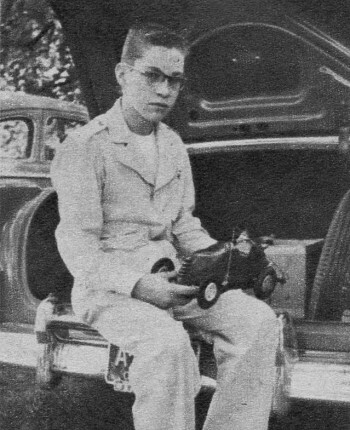 He squeezed the timer button and the clock raced - four, five, six - the car never let up. Mel Knell called out over the mike, "Time for the quarter mile distance was 6.05 seconds or 148.76 mph. There's your new Champion!" And there he was: first of the young fellows to break through and it looks like more to come. 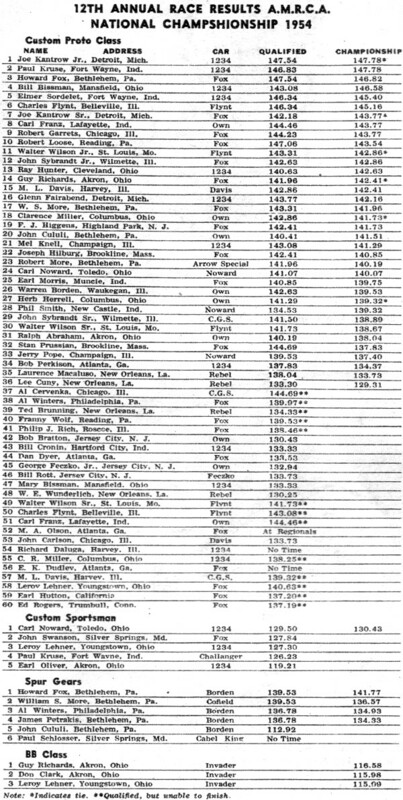 Walter Wilson Jr., 22 (our Custom Proto World record holder at 151.75 mph) , John Sybrandt III, 16, Jerry Pope, 18, Don Clark, 15, Lee Cuny, Phil Rich, Ted Brunning and Bob Bratton are some of those in this younger group and more are joining. This is a hobby for young and old alike. " 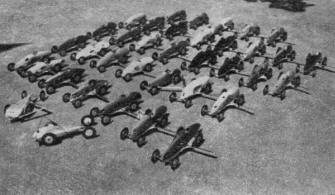 These were the entries on hand for start of the National Model Race Car Meet. Two front cars are entered in Spur Gear class. Our thanks to the people of Anderson. Indiana, for their wonderful hospitality. Any wish expressed to Mr. Mayor brought action. 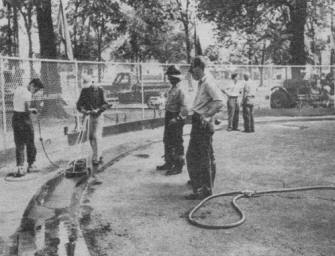 When it was time to scrub the track, there was a fire truck complete with four or five men. Tables were painted, flags hung and when we needed a tape to accurately measure a new cable, Mr. Mayor turned to one of the City Commissioners and said, "Go over to the Department of Weights and Measures and see what you can find." Sure enough we soon had one. The Mayor left us, telling of future plans to further improve the track and invited us to return there next year with the Nats. Needless to say, it would be a pleasure. 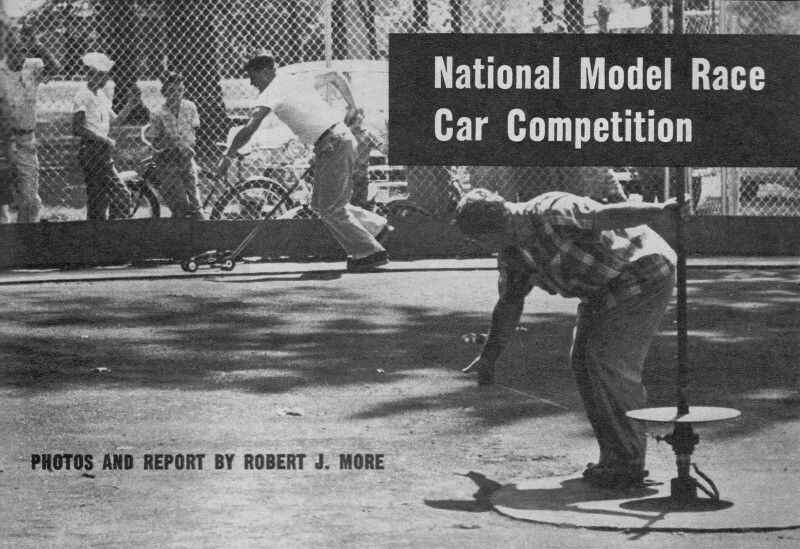 Before we go too far along I think it might be a good idea to explain briefly the sport of model car racing. First, all cars are powered by a .601 cubic inch displacement, two cycle engine. Ninety-nine percent of these are Dooling .61s. The car is geared and tired so that when it is up in the 140s. the engine is turning about 22,000 rpm. The rest of the power train consists of 1.5 or 1.75 gears and 4 inch diameter tires. That gear ratio means that if 1.5 to 1 gears are used the engine is running 1 1/2 times faster than the wheels. Ball bearings are used throughout engine and car. Ignition is standard and best by magneto. Since the fuel we use is essentially glow plug "Blast," we have no ignition switch (Custom Sportsman Class excluded) but instead we use a full shut-off valve. Careful cleaning is as important as careful running of a car. Bob Bratton uses syringe and white gas for dean-up at end of day. We put this six pound hunk of gears and stuff on a track that is concrete and seventy feet in diameter. Timed runs are 1/4 mile or six laps and the timing is in 1/100th of a second and electrically actuated through a center pole micro switch. For safety, we recently increased our cable size which is now .050 inches in diameter and 35 feet long. There you have all the necessary ingredients. Give the car a push and we're off to the races. Larry Macaluso of New Orleans doing fast gear box repair job. Was back on track in 20 minutes after gear-holding pin had sheared. We arrived early Tuesday evening to find to our surprise that plenty had happened already. Some eager beavers arrive Monday for a Thursday event! Yep, lots happened. Bob Loose and Stan Prussian blew into town just itchin' to run - but no welcoming committee. They got Doc Cronin on the phone who promptly flew down from northern Indiana with clock, cables, etc. So the boys set up the track and Loose promptly turned 148. Not content with this he switched from his 1.75 gears to 1.5s, shoved off the car, and right away tossed off both tires. This made the axle look something like a pretzel, DiGeorge of Boston then hit 145 but never attained speed after that. The New Orleans gang beaded by Bill Wunderlich was also there but a bit tired from an 800 mile drive. Higgins, Rott, and Feczko also hit town early. "That's it - shut it off!" Timer-announcer Al Winter gives welcome signal to contestant indicating official time was recorded. Prussian, the 150 mark breaker, was out for more practice but had bad luck when a new style wrist pin shifted in the piston, caught the ports and scrambled the engine. Bad luck was destined to dog him throughout the week. By this time oil and rubber lay on the track in such globs (due to so much running and no track cleaning) that cars began to spin. 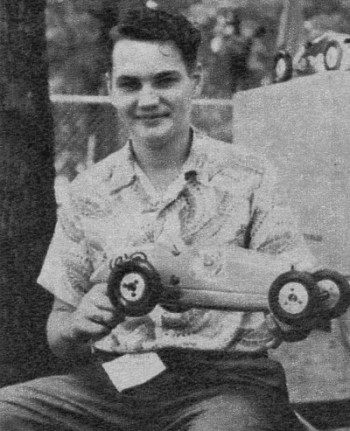 William More found that out when his Fox car engine did 180 mph, but the rest of the "bucket" wasn't even worth timing. This happened twice. After the last attempt he discovered broken tank mounts as did many others due to vibration from excessive slipping. That was trivial compared to Frank Higgins problems, though, for he sheared gear pins twice! This pin secures one of the two gears to, the axle and, of course, without it the wheel won't turn. Replacement means dismantling the car and gear box and about two hours' work to do it right. Carl Franz must not have noticed all the woes, though, 'cause he ran 145, wet track or no wet track. We all went back into town then just in time to see the Howard Foxes pull in bright and cheerful (?) after a non-stop 700 mile drive. The National Champion! 15-year-old Joe Kantrow, Jr .and his 148 mph "1234" class car. Joe's from Detroit; has big future ahead. This was it - the start of qualifying. The Mayor of Anderson and several City Commissioners showed up to officially open the track. In a short speech, Mr. Mayor extended an invitation to the AMRCA to have the '55 nationals back here at Anderson. 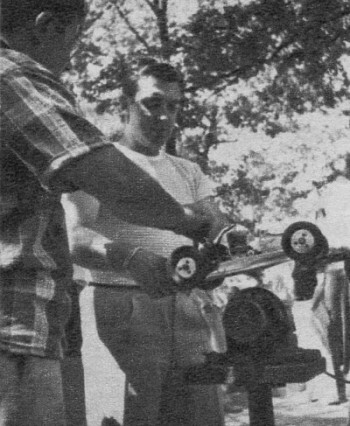 His Honor cut the tape and proxy runner Jimmy Petrakis, with Ed Rogers' car, was the first on the track. Fox followed, sans test run, with a mighty 147.54 which was to remain high qualifying time topped only by young Kantrow. To avoid the slipping trouble we had experienced yesterday, Fox suggested cleaning the track after every ten cars. Each ten owners were to clean it for the next group. Idea was accepted and it worked out beautifully. Prussian, a prerace favorite, had the unbelievable misfortune to have the clock fail on three successive runs. Starter motor is nice thing to have when car won't run. 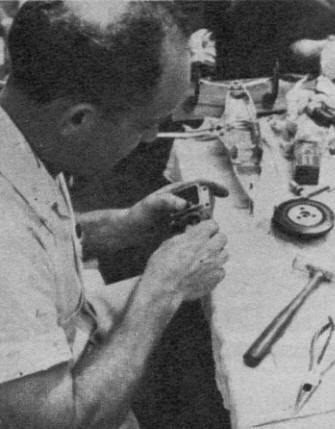 Here George Feczko and Jimmy Petrakis are trying to cure bulky ignition job. The air was mighty blue after No. 3. Seemed as though all the hot shots were jinxed by that clock as Junior Wilson Sordelet and Kruse all had the same trouble. Petrakis seemed to be proxy running for everybody and such troubles starting! 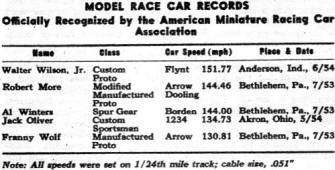 Note: All speeds were set on 1/24th mile track; cable size, .051"
Cars had no park and Jim was running out of "gas" himself. Those with starting troubles got one break, though. 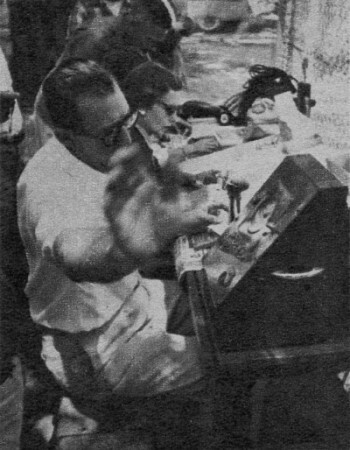 After one trip around Chief Tabulator Norward would reach under his desk, haul out an eight foot push stick, roar out on the track, shove the poor panting soul aside and just like that start the car. We believe there are magic words involved in his success story. All attention focused on the track as Junior Wilson took his rerun. The clock operated this time but the plug blew causing the engine to lose compression and the car limped through the last few laps for 142.86. The Sordelet and Kruse Team turned in almost identical speeds to remain together for the finals qualifying in 6th and 7th spots. They had lots of timer trouble, too, though, and on Kruse's good run he punched the clock button so hard it stuck ... had to be pried out. Considered on extremely fast car in its classification, Don Clark, 15, races this McCoy .60 powered Invader at speeds up to 115.98. With the exception of Fox the entire Eastern gang was having a terrible time. Name any ailment, they had it. Californian Earl Hutton had the misfortune to have a piston stick on the fifth timed lap. Net result was two flat tires and one weary engine. 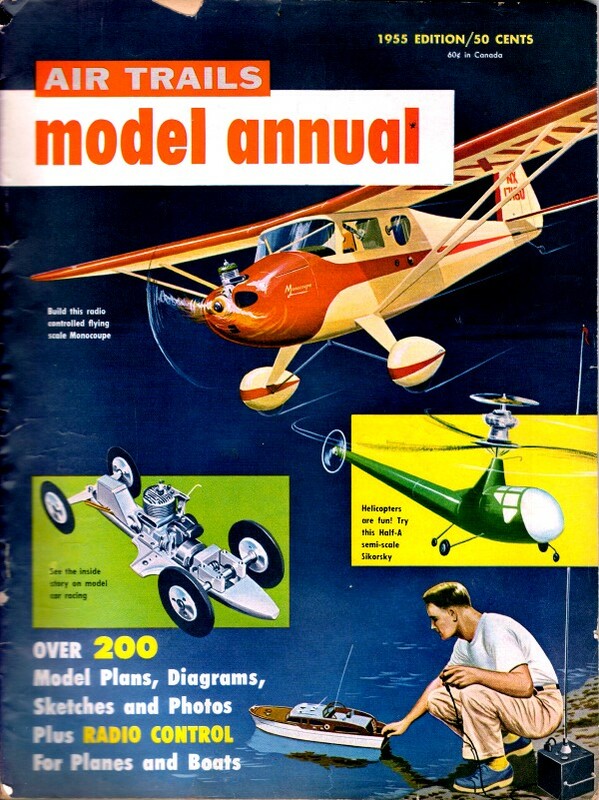 Phil Rich, a newcomer to cars but an experienced controlline model plane man, bought the late, past-Pres. Matthew's fleet of cars and entered them. It was felt that it would be only fitting that Matthews' AMRCA No. 18 should be assigned to him. Then at the end of the day another 15-year-older, Don Clark, shoved off his big McCoy Invader (Mac 60 powered) and for a time led in BB with 115.96 holding the winner, Guy Richards, at bay. Engine stuck but this doesn't hurt a Mac. 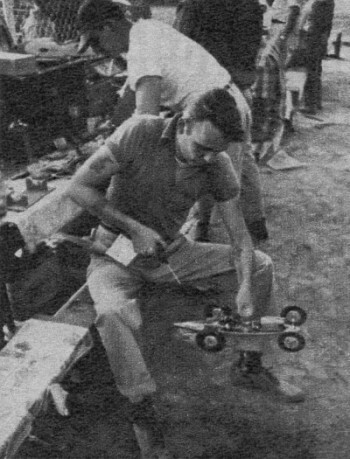 Ted Brunning hooks up Leroy Lehner's car., Since racing is one-at-a-time deal it's a lot less confusing than model plane meets. Foxy tried 1 1/2 gears as Loose had done and the tires stayed on but no speed. Hutton's all-night labor was wasted, as he pushed her off only to have the fly wheel let loose. And Loose's all-night labor paid off with 147.06 - but those poor bloodshot eyes. Red Abraham's car was most startling. Most cars take about a mile (24 laps) to get up speed, but his is ready to be timed after 7 or 8 laps. Got to be quick with the clock. Time's running out now - two hours to go. Clarence Miller arrived at 4 p.m. with two cars and did what others had tried to do in vain for two days, qualifying them both. Red Davis and his pals (Borden and Daluga) finally arrived and got two cars in. Davis' car had a clever and amazingly simple fuel shut off valve. It was a spring-loaded, pliers-like gadget that simply pinched the fuel line shut when tripped. This smoothed the fuel flow to the engine, eliminating the various right angle channels found in standard systems. Frank Higgins, a fine fellow and good sportsman, had miseries all week on this unfamiliar track, alternately spinning and bogging down the engine with too much traction. In a last, desperate attempt he put on a 2 inch longer bridle, weighted the rear end with lead and did 142.41 to. assure a spot. Graceful galloper is Stan Prussian of Brookline, Mass., first to crack the 150 mph mark. A healthy push is needed for starting. Probably the most pleasing thing about this hobby is the way all help each other even though each is trying to the utmost to win. Ask a man to help call time on your car as you wait to start the timing mechanism (a very important thing) and he'll try his very best. The very same goes for fuel or parts. General view of pit area shows some of the elaborate portable work boxes that many enthusiasts construct. Area is completely fenced. All rushed to get cleaned up and get back to Linder's Restaurant for the big spread. And it sure was. All ate a wonderful smorgasbord dinner. Regional Championship trophy awarding followed. The ladies were presented with beautiful jewel cases and due credit was given to Bill Cronin who was responsible for most behind-the-scenes good deeds. We then adjourned to the game room to view an excellent movie on racing donated by the Champion Spark Plug Company. Ending the evening was the business meeting. We finally got the question settled as to where the regional qualifiers (qualified at home track in special race) should run - at the top of the stack. The nomination of officers for 1955 then took place with Cronin and Flynt nominated for Pres., Wunderlich for V. Pres. and Noward for Sec.-Treas. Bill Wunderlich then gave us a fine talk on publicity. This man knows, too. Back in the '20s he was a race car driver and Gates stunt pilot. Carl Franz, Lafayette, Ind., made this Custom Proto himself. Considered meet's most unusual car, no castings were used in the construction. All parts were machined from 17ST aluminum bar stock. It placed 8th. We woke up to see - Oh, no - rain! So, we thought, that's all, they'll take the qualifying speeds and call it. But by mid-morning it cleared (99 44/100th % humidity reading) and we actually ran. Needless to say motors were really cooking. Foxy just couldn't get the cackle of pre ignition out of his. Loose discovered that near straight nitro methane with a pinch of oil is OK on average days, but this wasn't average. The 1234 man, Billy Bissman, looked back on those days of overhauling engines (seemed. he always had at least two apart at once at the track), sighed, and ran what he had stuck together. After all, what's the use. But, lo and behold, if he wasn't one of the very few to improve over his qualifying speed. We began to think maybe those qualifiers who couldn't run their cars in the finals were not so unlucky after all. The dry track fooled many, too. 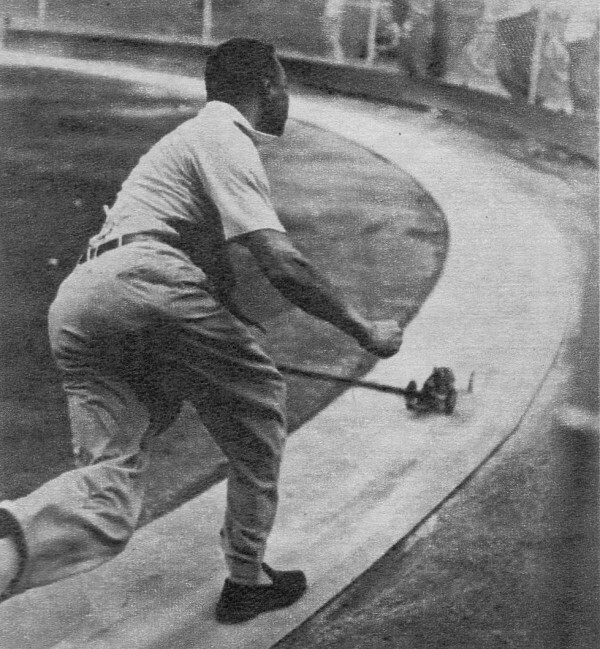 Henry Hargraves, ably assisted by the City Fire Dept., gave the track a scrubbing that left it like new. That meant no slipping at all and the fellows who normally called, their cars by lap counting, which is fine under average conditions, were way early. So they dug out the hard tires for the next heat to get some wheel spin. Larry Macaluso sheared the pin holding the axle. He did the impossible by changing the pin and getting back to the track in 20 minutes. Foxy was sensational with 142 in Spur. This car normally overheats even in ideal conditions, but somehow Foxy conquered this problem and it never sagged. On it went. Everyone was tired and it was becoming apparent speeds would not increase over the first heat. The tie for first would have to be run-off. The rest you know. Best cars: Kantrow's Custom Proto (Champ); Fox's Spur Gear; Noward's Custom Sportsman; Richard's Old Timer Proto (BB).